Gables facing the street and metal accent roofs invite families into a gracious house with traditional hints of flexible, comfortable living. The open two-story great room implies spaciousness, while nine foot ceilings throughout the first floor add volume and elegance. A living room/study is accented by columns and French doors to the front wrapping porch. Entertaining is a breeze in the dining room with a nearby pantry area and wet bar. 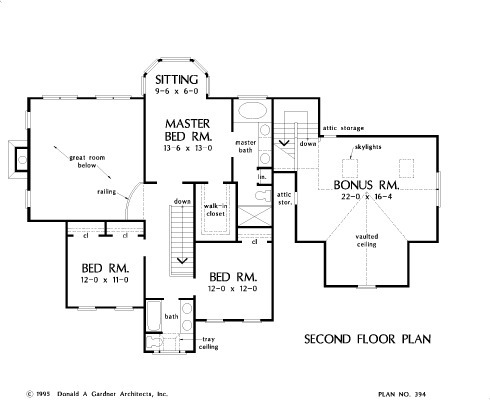 Upstairs, the roomy master suite features a sitting area, spacious walk-in closet, and full bath with today's amenities. Another bath at the end of the hall is expanded by a partial tray ceiling. 2nd Floor: 1008 Sq. 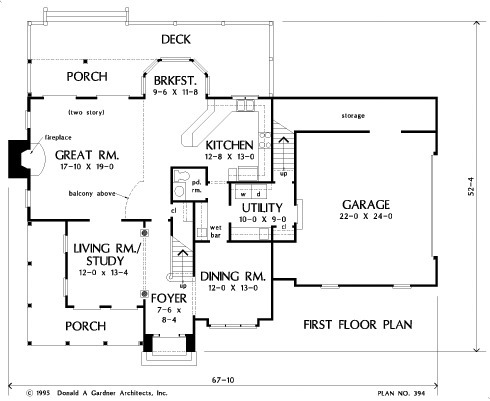 Ft.
1st Floor: 1385 Sq. Ft. Bonus Room: 544 Sq. 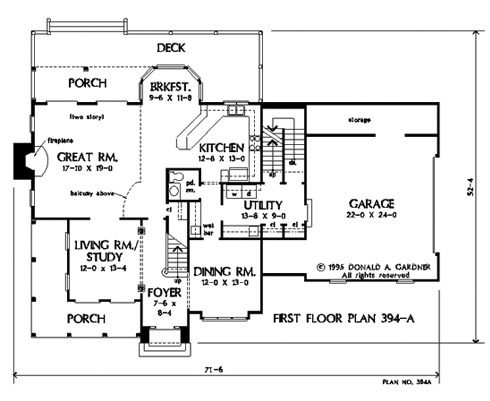 Ft.
House Dimensions: 67' 10" x 46' 4"
Great Room: 17' 10" x 19' 0"
Master Bedroom: 13' 6" x 13' 0"
Foyer : 7' 6" x 8' 4" x 9' 0"
Great Room (2 Story): 17' 10" x 19' 0" x 18' 1"
Kitchen : 12' 8" x 13' 0" x 9' 0"
Breakfast Room : 9' 6" x 11' 8" x 9' 0"
Utility Room : 10' 0" x 9' 0" x 9' 0"
Bonus Room (Vaulted): 22' 0" x 16' 4" x 11' 0"
Garage Storage : 18' 4" x 5' 0" x 0' 0"
Master Bedroom : 13' 6" x 13' 0" x 8' 0"
Porch - Front : 5' 4" x 2' 6" x 0' 0"
Deck / Patio : 38' 10" x 6' 0" x 0' 0"
Storage (Other) : 3' 8" x 5' 8" x 0' 0"
Other : 9' 6" x 6' 0" x 8' 0"